"We were fortunate to find your software through the internet and found it to contain all the necessary tools that the more expensive software packages have but at a fraction of the cost. We could never afford any of the fundraising databases we viewed but were able to purchase and implement the FundRaiser Basic." Even the smallest nonprofits sometimes struggle with keeping track of donors and donations, but letting those details slip through the cracks often means loss of donor trust and future donations. Basic is the perfect solution for the small nonprofit to store all donor and giving information in one location, and easily keep track of all the details associated with each name. Do you ever get the feeling that something may have fallen through the cracks? Are multiple spreadsheets a problem in your organization? FundRaiser Basic is the solution. Because Basic has flexible coding capabilities, you don't have to look at multiple spreadsheets to see your donors, their gifts, or their history with your organization. All of your constituent history can now be stored in one easy-to-use database. In the nonprofit world, every person that comes in contact with your organization is a potential donor. It is necessary, therefore, to have an accurate, secure database for recording all vital contact information. FundRaiser Basic will store your mailing addresses, email addresses, telephone and FAX numbers, and more, in one easy-to-search database. Best of all, Basic is built to store all of your contacts, even if they haven't donated to your organization (yet). People like to be thanked, and timely, personalized thank-you letters can lead to more frequent, and larger donations. 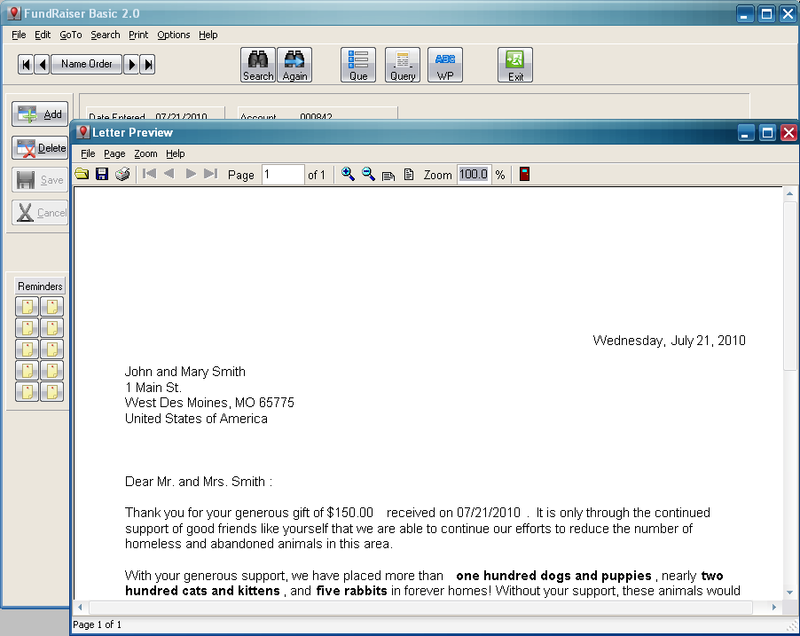 FundRaiser Basic makes it easy to automatically mark each gift for a thank-you letter as you enter it, then print all the letters and envelopes in one batch at the end of the day. 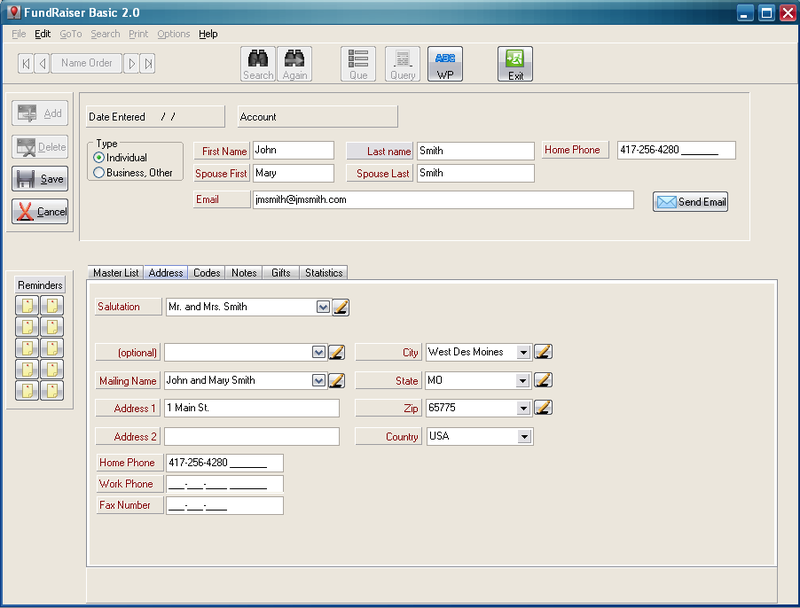 The built-in word processor lets you customize the included letter templates or the individual letters with personal notes, merge fields, and more. You can also create and save as many additional letters as you need. Are you holding an event, and want to invite your largest contributors? Or maybe you would like to send a targeted appeal to donors who gave last year, but have not yet donated this year. No problem - with Basic, it's easy to quickly see a 360-degree view of your donors by giving levels, donation date ranges, and more, then send the appropriate, targeted message. 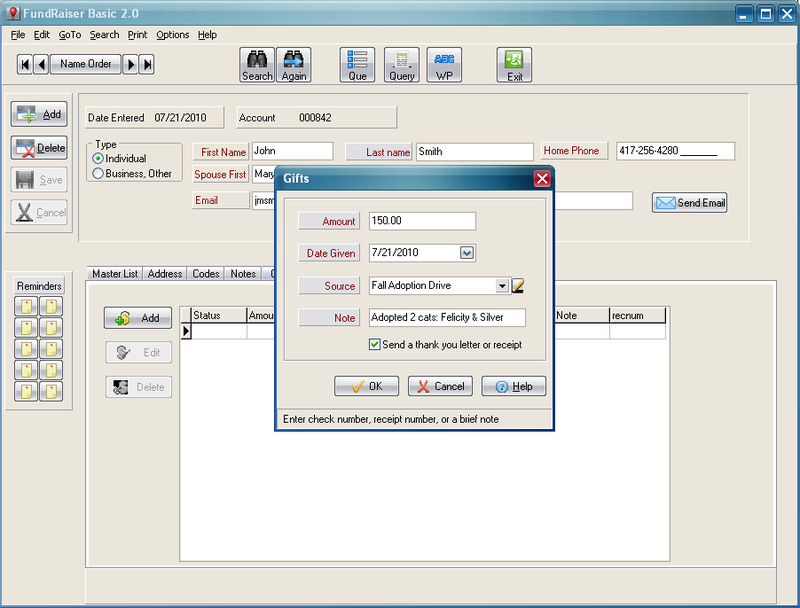 Easily print correspondence to the entire group, including labels, in one simple operation. Don't worry about the learning curve with Basic; it's so easy to use, you'll wonder why it took you this long to buy it! We designed Basic to be intuitive enough for anyone to pick up and use without investing in expensive and time-consuming training, so you can spend less time training, and more time fundraising. In no time at all, you will find yourself on a whole new level of donor management.